Easy to make and super healthy, these muffins are packed with whole grain goodness, chockful of sweet and tangy cranberries, and don't go overboard with the sugar. It's basically a four-step recipe: combine the dry ingredients, combine the wet ingredients, mix them together with the cranberries, and bake. They have a hearty flavor and texture, thanks to bran flakes, ground flaxseed meal, and whole wheat flour. The sweetener used is mostly honey, with just a bit of brown sugar and lots of cinnamon flavor. 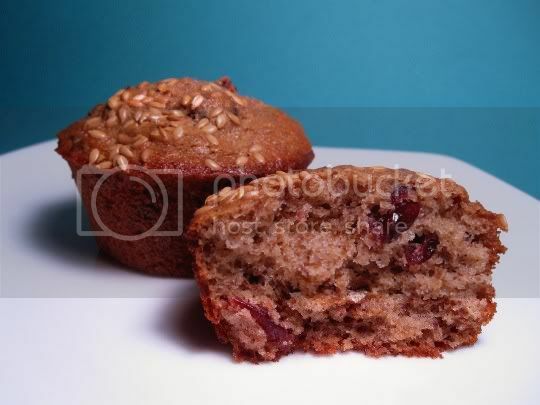 Whole flaxseeds are even sprinkled on top before baking, giving the muffins a nice nutty crunch. One thing I noticed: the batter is very thin and seems to require at least an additional five minutes of baking time. But be careful: I slightly overbaked some of mine, and as a result, the flaxseeds on top got a little extra "roasted." So play around with the oven temperature and time if you plan to make these! They also freeze very well, and kept their dense and chewy texture once thawed. Make again? Probably, with some baking adjustments, and maybe even different fruit (blueberries, cherries, etc.). Vegan variation: Use egg replacer (and a honey substitute if desired).